Poster design by Danielle Spiewak. Imagine if a group of artists, writers, craftivists, makers, dreamers, and thinkers dropped into your town for a few days and offered creative experiences for all ages? If they opened the doors of their caravans and buses and box trucks and set up spaces for folks to write poetry, make zines and books, create a collaborative mural, learn to knit, sew, play with paint and metal, cardboard and wax, chat with their neighbors about their artful aspirations? What if there were marbling, fermentation, welding or woodworking demonstrations? If there were books to check out and music to listen to and public art projects to join? What if someone handed you a camera and said, “Shoot what you love to look at in your community.” What if you could sit on the grass and read handmade sketchbooks or your favorite classics for hours or dip inside a trailer to tell a story that would be recorded for others to listen to years later? What if you could make your own short film? Join a flash mob of dancers? Make your own ice cream? Learn about herbs and their connection to wellness? Do yoga or Tai Chi in a field? Blow glitter onto a truck covered in glue? Historically, the first carnivals were celebrations that took place before the Christian season of Lent. From an anthropological point of view, carnival is a reversal ritual in which social roles are reversed and norms about desired behavior are suspended. Common features of carnivals were excessive consumption of alcohol, meat, and other foods, mockery of officials, degrading acts, and abusive language. In other words, a certain kind of unchecked debauchery. 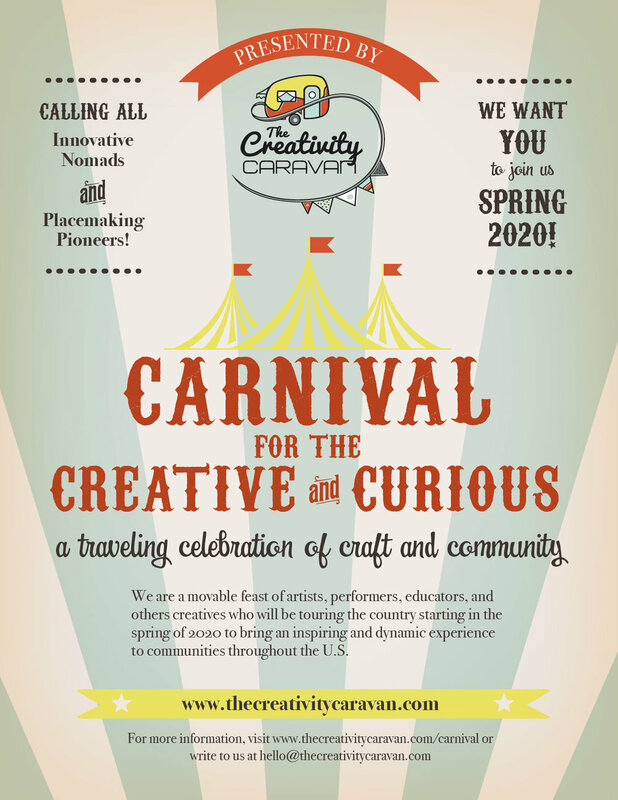 The Carnival for the Creative and the Curious is the antidote to that type of carnival. We would like to reverse that reversal and instead, bring a traveling celebration of community, craft, commitment, compassion, and kindness to your town or city. What if our form of debauchery was an extreme indulgence in making a creative mess just to see what can happen when we gather for the purpose of feeding our innate curiosity? What if the tents we put up were a good old-fashioned revival of our creative spirits? We are currently in the seedling stages of plotting out this idea. We are seeking further input and mining the possibilities, beginning to identify route ideas, and, most importantly, looking for potential partners to join our carnival. Partners might join us for the whole route or a portion of it. Partners might meet us in specific locations or invite us to set up camp in their home city and host us. Partners would be responsible for their individual creative activities at each stop, but we would all work together as a whole team to plan the events that would unfold in each location. Between the two of us we have successfully funded four traveling creative projects via Kickstarter: Tour de Word, Type Rider: Cycling the Great American Poem, Type Rider II: The Tandem Poetry Tour, and The Tiny Book Show. We know how much time and work it takes to map out such a gargantuan idea and we are ready to roll up our sleeves and make it happen sometime in 2020. We are also developing this idea with sustainability in mind - environmental, social, and financial. We aim to design an experience where participating artists can be paid appropriately for their work. We hope to offer a large percentage of the events and activities free of charge (or very low-cost), so what this means is that our hosts in the communities we stop in - as well as allies and supporters elsewhere - will be invited to contribute resources to this undertaking. Calling all Innovative Nomads and Placemaking Pioneers! At this point we are simply looking for others who feel a deep resounding YES when they hear our idea, who feel the call to travel, to create a community on the road, who are ready to jump into the unknown with us and see where this call to action leads. We don’t need a formal commitment, simply a raised hand of interest and the willingness to dive into further organizing our thoughts around how this could unfold. We are searching for an A-team of folks who want to invest their time and energy into a Carnival for the Creative and Curious. Send us an email at hello@thecreativitycaravan.com if you feel that YES.